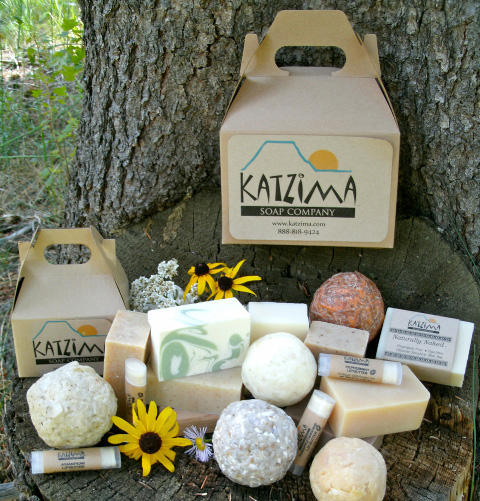 Katzima All-Natural Soap Company – That's Natural! Nestled in the mountains of Northern New Mexico is a soap company that cares about your skin’s health. It’s no secret that the environment can be harmful to the largest organ in the body – the skin. Detergents, pollutants, common household cleaning products, beauty products can all contain common enemies of the human body. Human skin absorbs just about everything you put on it, so why not take better care of your skin and body with pure and natural products? Rebecca Sakelaris, proprietor of Katzima Soap Company, is dedicated to producing nourishing soaps crafted with the ingredients only nature can provide. Her soaps contain all natural oils such as soybean, coconut, olive, and canola oils – products that love your body instead of harming it. Constantly striving to perfect her products, Rebecca produces her soap only in small batches to ensure high quality and freshness. She offers a variety of soap lines: All-Natural, Goat’s Milk and Boutique. The All-Natural line contains only ingredients made by Mother Nature, lightly scented with essential oils or unscented for those with the most sensitive of skin. Customers with problem dry skin may prefer the added natural moisturizers in the Goat’s Milk line of soaps. The Boutique soaps are made with the same natural ingredients as the others, but may also contain oxides and/or fragrance oil for color and scent. Katzima soaps are true soaps. True soap is a cleanser made with simple ingredients that are good for your skin, whereas mass-produced commercial bars typically contain synthetic detergents. Because of this, the FDA regulates their labeling of ingredients, but buyers beware: their advertising claims are not regulated. Consumers note: you may hear the word “soap” in commercials or you may read the word “soap” in advertising, but the word “soap” cannot be displayed anywhere on the label unless the product is true soap. Handcrafted soap, on the other hand, is true soap. True soap is what was made and used by mankind for centuries before synthetic detergents were created in the 1930s. By combining oils or fats with an alkali (“lye”) and water, true soap is made. The products of this reaction are soap and glycerin. Soap cleanses the skin, while glycerin moisturizes it. Lye is not a synthetic chemical – it can be made by soaking wood ashes in water! Glycerin is naturally produced during the handcrafted soap-making process. Glycerin is a humectant, which means it attracts moisture from the air and holds it to your skin, thereby creating a moisturizing effect. Pound for pound, glycerin costs more than soap. Some soap manufactures remove the glycerin from their soap and sell it to manufacturers of other products, such as lotions, shampoos, conditioners, cellophane, etc. Katzima Soap Company does not remove the glycerin from their handcrafted soaps. Soap made by Katzima contains all of the naturally occurring glycerin. This glycerin, combined with Katzima’s super-fatting technique, creates soaps that are gentle to dry and sensitive skin. Rebecca says people frequently ask if there is lye in the soap. The truth is there is no lye left in the final soap product. Lye is used in the initial production of the soap to create the chemical reaction between the water and oils. This reaction is called saponification, and lye is no longer present by the end of the process. Katzima’s intricate soap-making process and use of superior ingredients earn their soaps the title of “hand-crafted”. People can use them daily with confidence. Modern life means our skin is engaged in an environmental war, and using natural soaps from Katzima can help protect you and your skin from further damage. To learn more visit us at www.katzima.com or call Rebecca at 888-818-9424.